Our guides, in medieval clothes, will welcome guests to accompany them on an exciting tour of the Castle of Mondaino. Between history and anecdotes popular you will walk through the village until you reach the ancient mill of Porta di Sotto (sec. 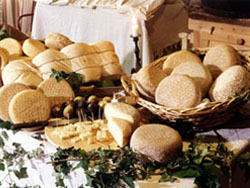 XVI) to find out the age-old process of Fossa cheese and let delight from the tasting of our best products. 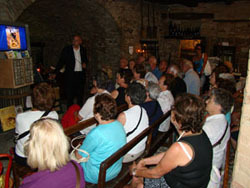 Tour of the Castle of Mondaino – only for groups of 15 or more. One of our guides, in medieval clothes, will welcome the group to the main entrance of the Castle of Mondaino (Porta Marina); among those present will choose a “madonna” or “sir” to play as medieval and parading with our guide through the streets of the village. After the welcome you will stop in Piazza Maggiore (the famous “Pan”) to admire the Malatesta Fortress and the colonnade of Cosci, then walk along the town’s streets and discover the history and traditions of the ancient mill until reaching Porta di Sotto. The tour takes place all in Mondaino outside for a period of about 20/30 ‘and is entirely free. 3) fee – € 12.00 (including VAT) – to sit (max capacity: 50 seats): individual plates with four cheeses, honey, jam, two meats, flatbread, crouton with truffle sauce, crudités season water Sangiovese / Bianchello, trick of the house wine and sweet cherries cherries as final. At the end of the tasting you can buy all the products tasted along with a wide selection of local specialties. Days and visiting hours will be booked in advance and agreed with the direction of the mill by mail: info@portadisotto.it or by calling 339/1628161. Transfer up to Mondaino charged to the group. The foreign groups must be accompanied by an interpreter. Any changes to the program made by the Directorate shall be construed made in the interest of the guests. The contents of the visit not be in any way diminished. 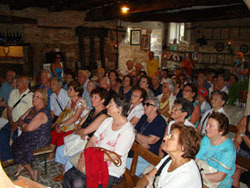 • In case of rain, the tour includes a single visit to the Mill of Porta di Sotto.